One way to show family and other guests how much you value their visit is to set a distinctive table for the meal you have invited them to enjoy. Setting a formal or even an artsy table speaks your love and care. Making individual name place cards is an easy craft that adds an extra-special touch. Dinnerware does not have to be fine china. 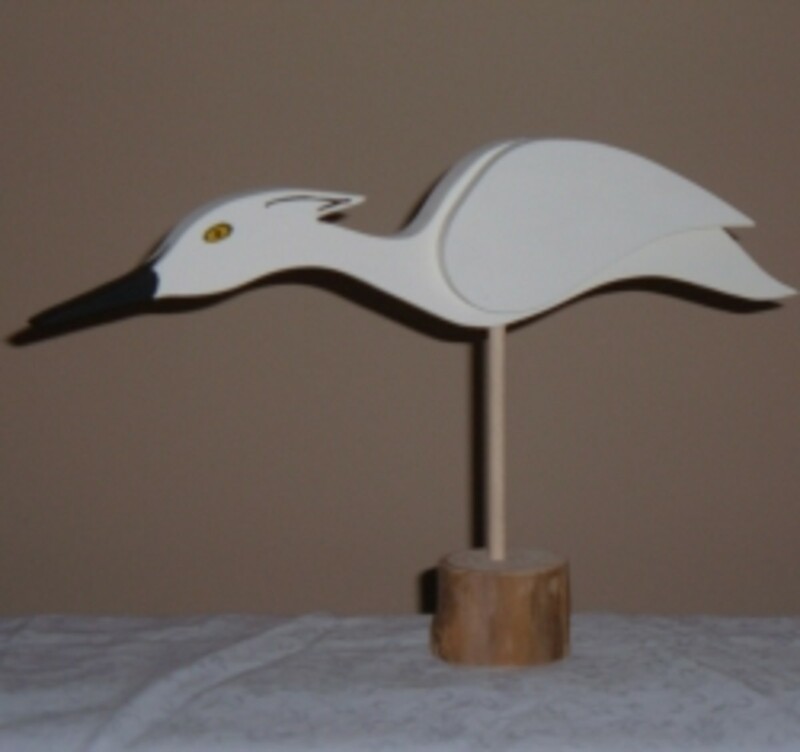 It can be an eclectic mix of antique ware or even daily ware. Centerpieces and tablescapes will always stand the test of time, and decorative napkins and napkin rings are delightful whether they are traditional or imaginative. Including place cards in your settings is an attractive and useful detail that often surprises and always delights diners at a nicely set table. 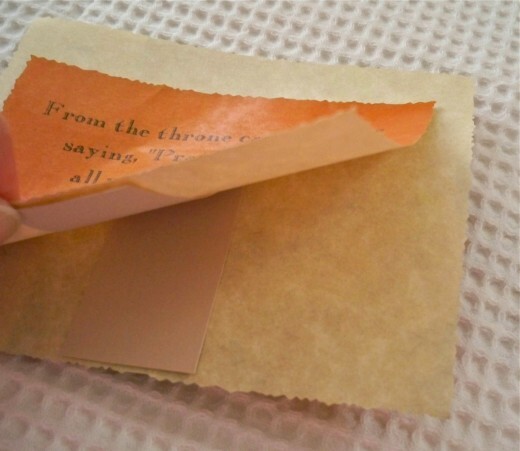 You can include children in the process of making them, or print off elegant cards in a blink. Whatever your style, consider making cards that have a significant purpose. We like to design cards that have the diners' names with a small menu, then inside or on the back we also add a Scripture verse that fits the occasion. At Christmas, for instance, the verses might include the prophecy of Jesus’ birth from Isaiah, as well as verses from Matthew or Luke’s record of the events. A birthday celebration could have verses of blessing to each guest. Resurrection Sunday would have verses confirming our confidence in Christ's atoning work. 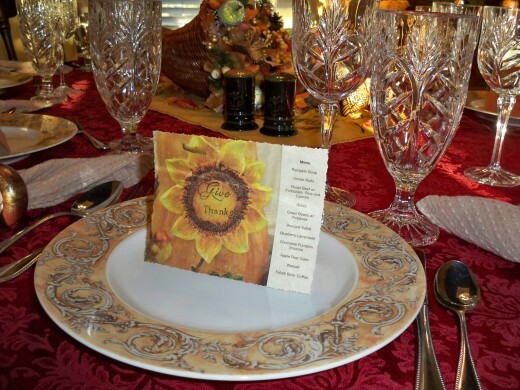 Even patriotic holiday picnics can be enhanced with place cards because it is important for a family to be thankful for their national heritage. For several reasons, part of our family visited a week earlier than Thanksgiving Day. Because everyone would be eating turkey in other locations the next week we decided to have roast beef with trimmings. Keeping the meal simple suited everyone, but we wanted to highlight the season with a festive table. 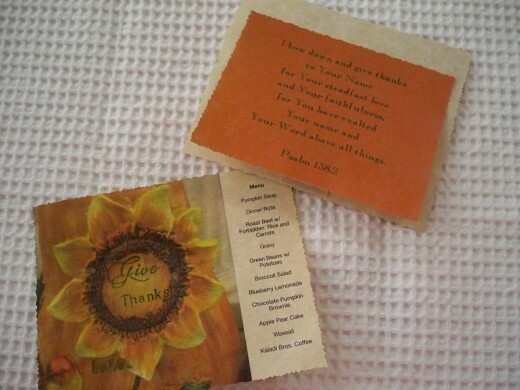 I simply photographed part of a Thanksgiving decoration from Hobby Lobby that had the words “Give Thanks” on it, and then positioned it on a postcard template for this project. However, a template is not necessary. The photograph could simply be placed on a document page. Putting a textbox for each person’s name and a textbox for the menu beside the photograph allowed me to use decorative edge scissors to cut out the front of the place card. Mine needed to be a little bigger than the back piece. The back of the template allowed me to make a smaller card for the back. Arranging each of the chosen verses in the center of the textbox and choosing Old Copperfield for my font was quick work. A computer is not necessary, though, since each one of these place cards could be hand made with all of the scrap booking and card making supplies that are readily available in so many stores. I actually had a printer glitch and wound up taking my project to the local Kinko's for quick printing! 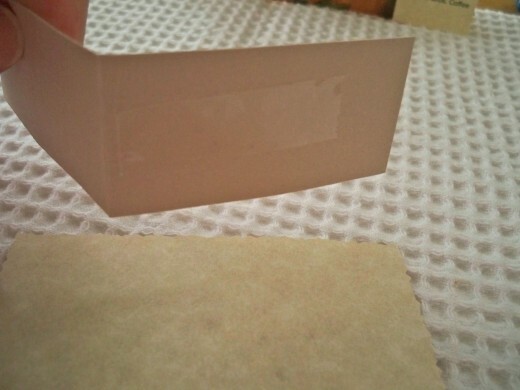 • Using either cardstock or regular weight paper is fine for this name place card project’s front and back pieces because the easel inside the place card is made of card stock. • My measurements are not a rule. You may want to adjust measurements to suit your project. 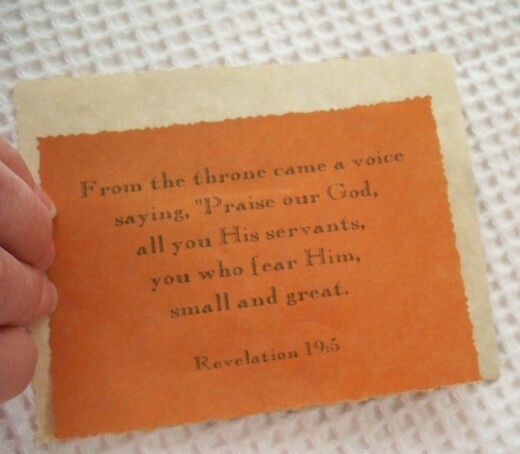 • The front piece of this place card (the decorative photo, name, and menu) is 5 1/4” wide by 4” tall. 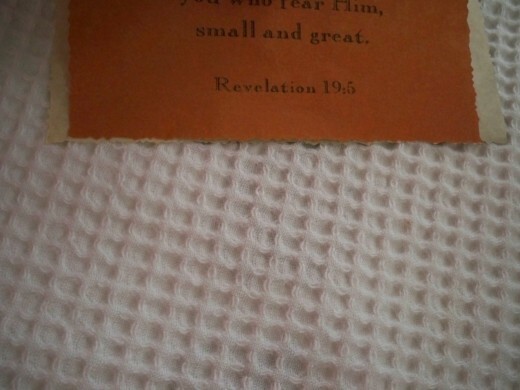 • The back piece (the verse) is 4 1/2” wide by 3 1/4 tall. • The inside easel is 1 1/4” wide by 2 1/2” long. 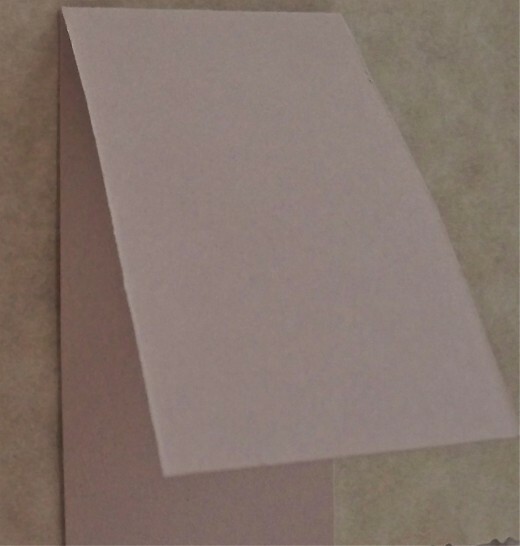 Be sure to use a coordinating color of card stock for this piece of the project. 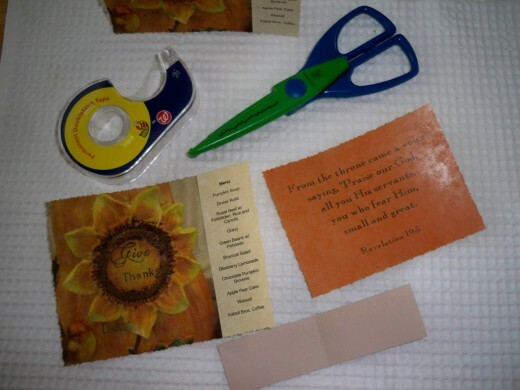 • You will need decorative edge scissors, double faced tape, and the front, back, and easel pieces. 1. 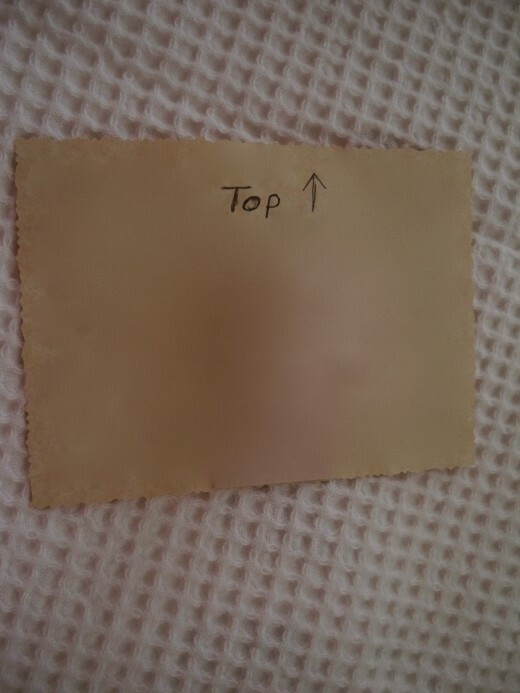 About halfway down the back of the front piece lightly write “top” in the center of the back and draw an arrow beside the word “top” pointing to the top. Do the same with the back piece (the verse piece). In the photo my written "top" is a little high--thankfully not too high. 2. 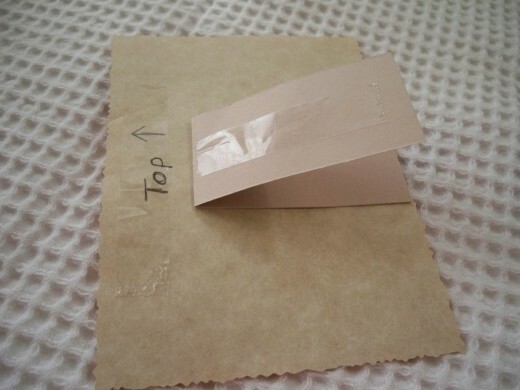 Fold the easel piece in half lengthways, firmly creasing the fold. 3. 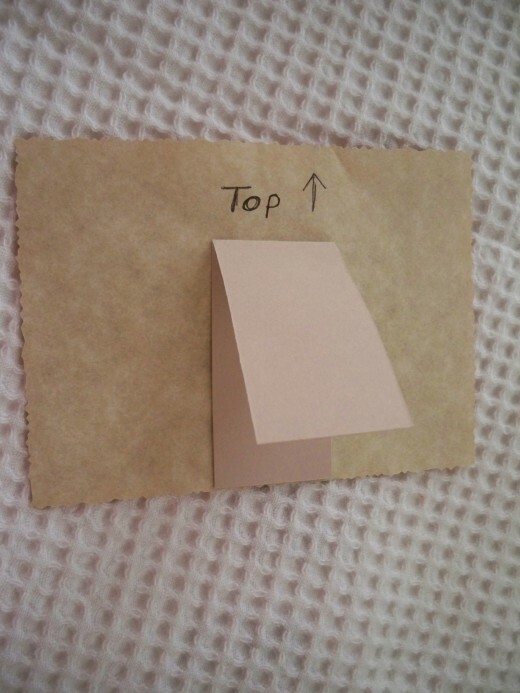 Put a strip of double-faced tape on one side of the easel piece then position it in the center of the back piece, matching the open bottom with the back piece's bottom. Press in place. 4. Place a strip of double-faced tape on the back of the verse piece, centering at the top, and on the easel’s up side. 5. Center the verse piece on the taped easel piece, holding the taped top up until the bottoms are evenly placed. Press top in place. 6. Store flat until you are ready to use your name place cards. 7. Stand in plates for use before giving thanks. 8. A view of the easel taped inside the place card front and back pieces. Before giving thanks for our meal, each person read their verse out loud. It was a simple, but precious few minutes. Most of the time our guests like their name place cards with verses so much that they want to take them home at the end of the evening. That, of course, makes us very happy! Just for Fun: A Place for Everybody, Everybody in Their Place! Making your own fabric napkins is an easy and economical way to dress-up your table. Can't You See Turning This Into A Place Card? With a cow milk allergy the stabbing pains in the stomach are usually first. Then the other symptoms hit. Cow's milk alternatives help. We can love living gluten free if we need to, but we can also love it if we simply want to be careful about eating concentrated amounts. My gluten free brownie recipe is living proof that the food we need can be what we want. These plump, chunky Chocolate Pumpkin Muffins are full of good-for-you stuff. Pecans, full-flavored coconut oil, healthy eggs with quality chocolate--breakfast never tasted better. For all my focus on healthy eating habits, smoked turkey is my not-necessarily-so-healthy specialty during the holidays. Many soups are enhanced by the rich subtle flavor of smoked turkey broth. This one is perfect for anytime! It can be canned or frozen for use throughout the winter. ❦ How Do You Like This Place Card Idea? Glad you like this project hub. :) Thanks very much for stopping by and commenting! Have a safe and happy New Year's weekend! RTalloni, what a great idea, and guests have a pretty place card to take home and display. Thanks much for the positive input--I appreciate that you came by and let me hear from you! Hope you get to enjoy using this idea some time. These are a great idea RT. And great that you included step by step directions. Pretty finished design too. Voted up. Thanks kindly--hope we get to see some samples of your work. Have a lovely Christmas Eve! Love your icon, and loved the wonderful, creative placemats. Of course, I shall have to make some now, as I have "itchy scissor fingers." Thanks for this fun hub! Hi RTalloni, I love your very practical approach to entering into the spirit of the festive season. It's a real reminder of what is important. I'll be helping some people out this Christmas with the preparing of the festive dinner, so I will make an effort to take some of your ideas here and put into use. I know the people will be very appreciative of the 'handmade' effort. And that to me, as you know, is what counts. So your hub is a very complementary source for the season of 'good will'. Thanks very much! 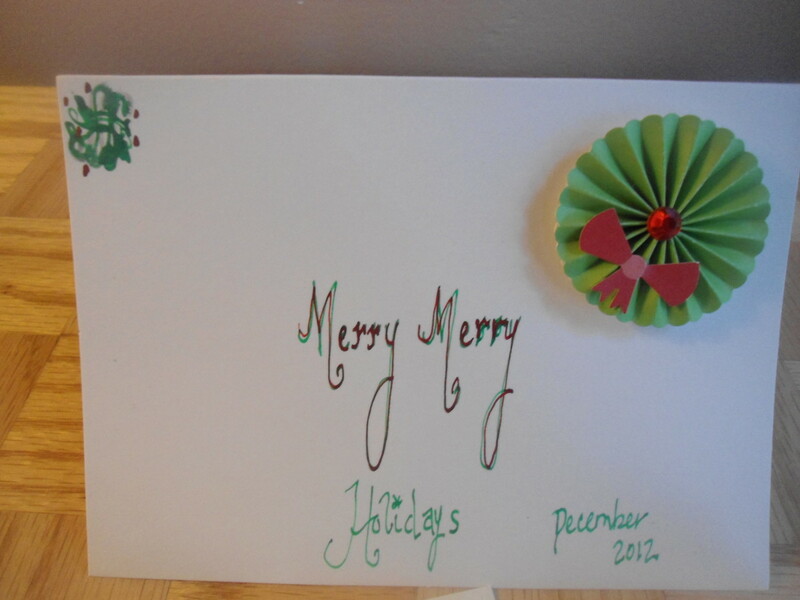 I admire those who can do the calligraphy for place cards, and I would love to learn that craft. As it is, my computer fills the gap. I can do a very simple decorative name, but even my simple calligraphy doesn't do the job for a menu and verse. So appreciate your visit and kind comments! This is an amazing idea! I have used calligraphy for the names on place cards at some of our dinner parties...but this idea goes much further. Your guests must feel so special with all of the time and effort that you put into creating yours. Beautiful table setting by the way! Voted up, useful and beautiful. Thanks kindly! I'm so glad you liked the idea, and I appreciate your input very much! Thank you very much for coming by and for letting me hear from you. Trust you had a lovely Thanksgiving! I wish I saw this hub a few days ago; it would have been a terrific final touch to our Thanksgiving dinner table. I definitely am going to do this next time I host Thanksgiving or modify it for other occassions. ~voted up and useful! Thanks kindly! 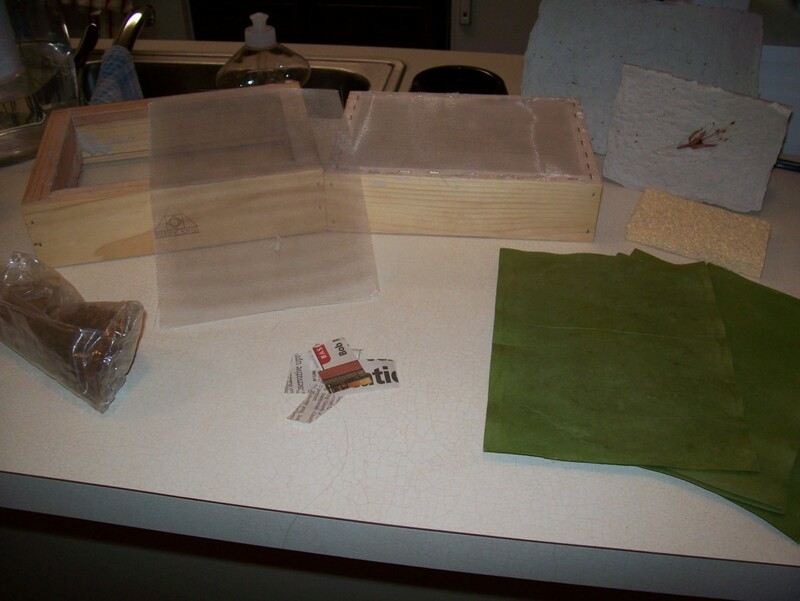 The cards are indeed easy to make, and there are several other ways to put them together. Simply using a flat postcard style for a quick place card or folding a quarter sheet of card stock and using stamps for the design are just a starting point for the neat ways to make them. 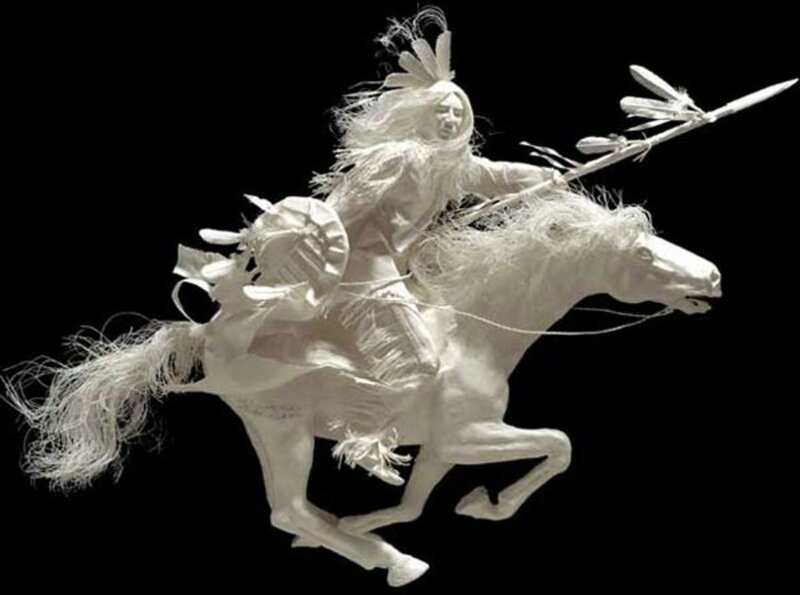 I appreciate your visit and vote very much! Hi Rtalloni!! 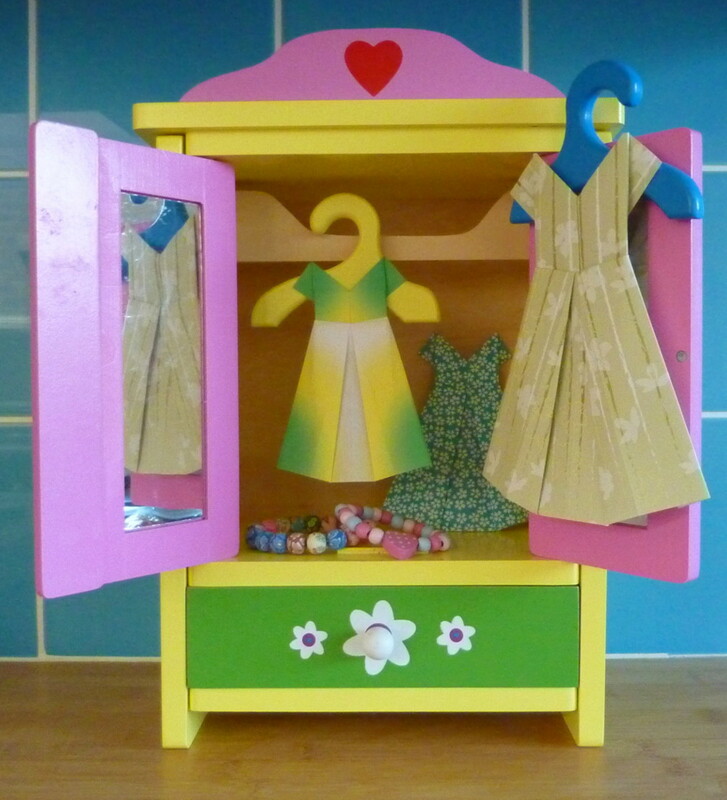 it is such a lovely idea and the cards seem to be pretty easy to make! voted up! So glad you like the idea of this craft. I remember the first time I did it I wondered how everyone would like it, but they always love it. Taking a little keepsake home with them with a Scripture verse on it is something they find to be a blessing. Very much appreciate that you came by and let me hear from you! Place cards are a lovely idea, not something I have ever thought of doing. Your step by step guide and pictures are excellent. This is a wonderful hub, I have bookmarked it and am voting up, awesome and useful, thank you. Thank you--so glad you like the project. I appreciate your visit, your comments very much! Thanks so much for your encouraging comment! I'm not really confident in creating "how to" hubs--enough detail as opposed to too much is a fine line sometimes. So glad you like this project and I hope you get to do the craft soon! So glad you like the idea of this craft. I enjoy doing it, and the responses we get from guests fits the truth behind the quote "blessing them blessed us." Thank you for stopping in with your comments! I love that the placecards are much more than a name! Beautiful. A big vote up! I love the place card idea and voted it up - and the individual thanks on each card is a lovely addition. Also like simple crafts like this, one that we all can do, a little something that's not only fun but lets your guests know that you care about them. Hello R Talloni. I absolutely loved this hub! I have bookmarked it and Voted Up, beautiful awesome and interesting. 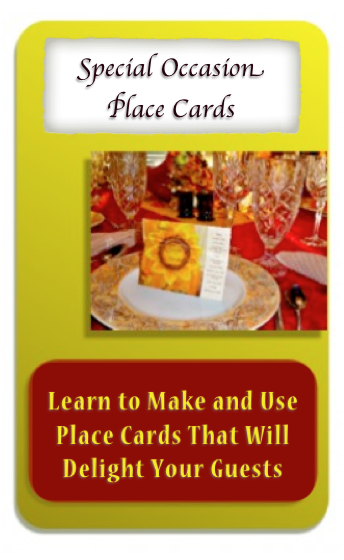 Your photos were very helpful in showing exactly how to make these place cards. Although we are not hosting Thanksgiving or Christmas this year, I know that when we do host I will be using your place card idea. Actually these could work just as well for other dinner parties during the year. These place cards are so beautiful and most importantly, meaningful (in addition to their obvious function of indicating the seating plan). I also liked your helpful pre-selections of Bible verses for Thanksgiving.